The Game is Saturday, November 10, 2018, at 2:00 p.m. at Woodberry Forest School. The annual football game between Woodberry Forest School and Episcopal High School is the South’s oldest continuous high school football rivalry—a fierce but friendly struggle that has consumed students, players and alums of the two prep schools since 1901. 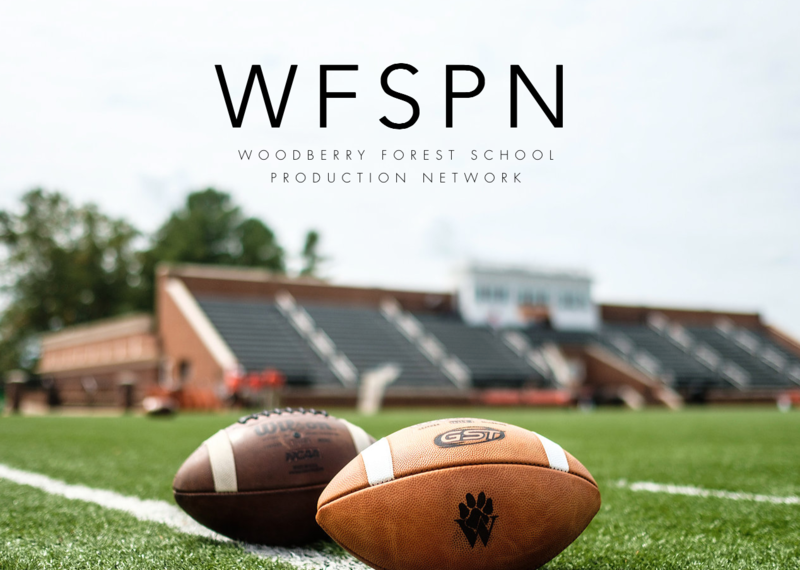 ﻿ This year the game will be broadcast live by WFSPN, Woodberry's student broadcasting network. Tune in at www.wfspn.org. Watch parties of The Game will be happening in Dallas, Columbia, and NYC. If you're in one of these cities and would like to join, please reach out to Kristina Jones at kristina.jones@woodberry.org or 540-672-6078 by November 3 to RSVP. Go Tigers! High School, at Johnson Stadium. This year will be the 118th meeting between the two schools. Many families come to Woodberry to participate in the weekend’s activities, the details of which follow. We require all students to attend the game, and many will depart from the game Saturday to stay overnight with their parents. Please be mindful of parking signs and parking areas as we will be hosting many guests. Students may not leave campus when their parents depart for dinner. 6:30 p.m. - 9:30 p.m. CAPTAINS CLUB DINNER-Remember to RSVP! We will host our annual Captains Club dinner in the Barbee Center for donors who supported Woodberry at the leadership level last year and members of the Walker Society. Eligible donors have already received their invitation. Join us for Woodberry's annual Bonfire Bash, which will be held Friday, November 9, from 8:00 p.m. to 9:30 p.m. This informal, family-friendly event — featuring Donut Kitchen, s’mores, cocoa, face painting, balloon art, and camaraderie — will take place in the Squash Pavilion (behind Johnson Stadium) to set the stage for the legendary bonfire. Following the Bonfire Bash at approximately 10:00 p.m., the Woodberry community, along with visiting guests, will gather at the bonfire. The bonfire is the ultimate Woodberry pep rally and a tradition the boys love. Expect to be amazed by the energy — and the heat! Should you choose to attend, you will stand in the field with other guests and watch the action. The dress code is “festive casual” — wear your orange and black! Be prepared for cool or wet weather; rain boots are often a good idea as our fields can be muddy. All students must return to dorm by 10:45 p.m.
Class tailgate organizers have been given passes for their reserved spots. Show your Tiger pride by wearing orange and black, and be prepared to cheer! Please don’t bring banners or signs to the game. We look forward to welcoming parents, alumni, and friends of Woodberry back to campus next month for the 118th consecutive football game between Woodberry Forest School and Episcopal High School. This year all game-day parking will be in the fields and gravel lot as outlined in the parking map. For safety reasons, we cannot allow any football traffic up the hill on Saturday morning, though Admissions candidates will be able to drive up the hill for interviews and tours. Tailgate parties for current parents will be located near the turf field adjacent to Johnson Stadium and will be designated with large class banners. Please plan to park in any open spot in the field and make your way over to the tailgate. This year we will have open parking, so plan to arrive early if you would like a spot near the tailgate. These rules are in place because of construction work currently underway in the area near the Walker Building and the heavy pedestrian traffic on campus that weekend. 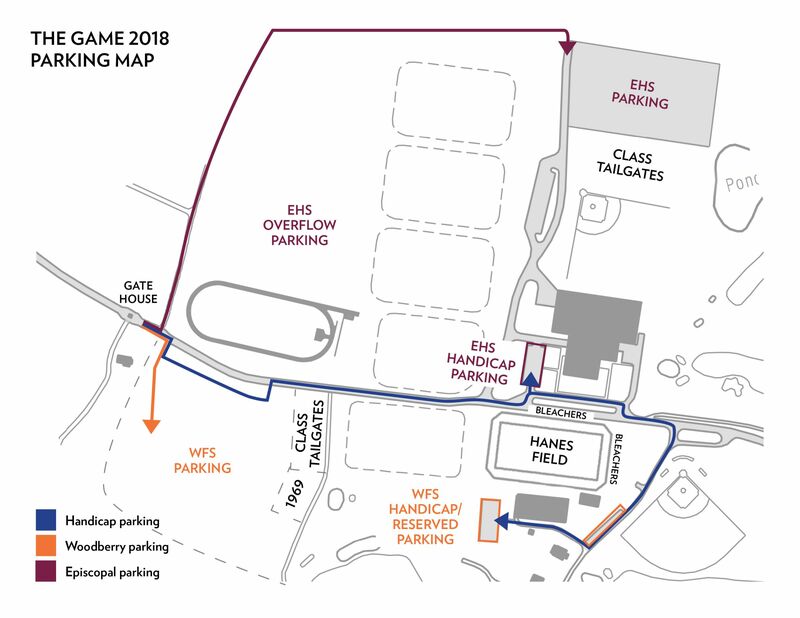 These parking restrictions also ensure the safety of our visitors, since the temporary bleacher we erect for the EHS fans sit on the main driveway near the Barbee Center. Thank you for your cooperation as we ensure a safe and exciting weekend for students, school employees, and our guests from Alexandria.